A writing retreat could be just what you need to start that book, finish your non-fiction manuscript, collection of children's books, or revise that short story you've been meaning to send in for publication. Life is full of distractions, from mobile devices and children, to housework and running errands. And, there’s that career or job in some cases too. You try to write at home in the evenings and on the weekends, but it's likely you are exhausted from the work week and find it hard to focus. How often are you interrupted during your sacred writing time? Do you check your email, notifications or texts when you hear the bells go? Do you find yourself in and out of the kitchen, cleaning the toilet or walking your dog to avoid writing? Or let's talk about the kids or spouse making noises and want to talk to you while you’re trying to work? Those little interruptions add up big-time, even if they’re only for a short minute, because they disrupt your flow of ideas and energy. Family often can’t understand the writing process and it is probable your friends just can't figure out how anyone would want to spend all that time writing. The only people who truly understand are other writers, but as writers we tend to be solitary creatures. We write in our bubbles, in some cases doubt our abilities, celebrate our brilliance and then collapse in the fetal positiong when we realize how stuck we are – and, all alone. We long for that breakthrough, for a chance to push our writing careers ahead, to be recognized by our peers and appreciated by our family and friends for who we are: writers. How can we experience that breakthrough if we don't change the dialogue? This is why Writing Retreats are exceptionally powerful. A writers’ retreat helps writers step out of their comfort zone. These retreats help immerse them in unfamiliar situations or surroundings. With new experiences, you gain new insight. Writers’ retreats provide outings and experiences that expose the writers to a different community, activity or atmosphere. This structure helps them learn about other environments, perspectives and more. This experience not only provides new stories to tell, but it helps explore new territories in our writing and creative process to find other ways in which to express those must-be-told stories. Writers’ retreats provide feedback and guidance from expert writing coaches. For example, during my writing retreats I will help problem-solve, hold your hand when you need it and shed light on habits that might be holding you back. In this environment, coaches are able to give you lots of one-on-one time and plenty of opportunity to ask questions and discuss your writing project and process. A writers’ retreat helps eliminate the noise and distractions. Do you feel blocked, stuck on ideas, restless or even frustrated? A change of environment at a retreat can help you function in a more relaxed, focused state that can stimulate new ideas. The retreats allow you to immerse yourself totally in your writing and find the focus you’ve been seeking. Lastly, Writing Retreats offer you an opportunity to meet other writers. Meeting other writers' is especially important when we are looking to propel our craft to the next level. When we are surrounded by those on similar, determined journeys -- results are inevitable. Meeting other writers, sharing in the experience and life of a writer can feel like coming home to people who, like me, have been called to writing so strongly. a for years. If you ask me, meeting other writers face to face, not just on the Internet, is THE BEST part of any writer’s retreat. You’ll feel like part of a community. And you have the potential of making life-long writing friends! Are you considering attending a Writing Retreat? If so, I have some great news! 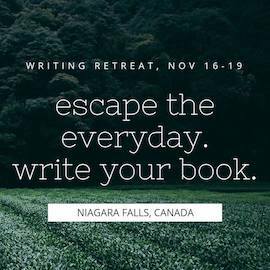 I still have a small number of spots available for an upcoming Writing Retreat in Niagara Falls, Canada. To Register, visit this link > REGISTER HERE < and I look forward to seeing you November 16 through 19.